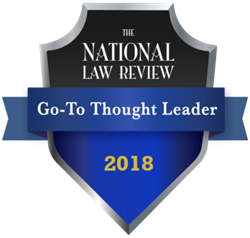 The 2018 “Go-To Thought Leadership Awards” recognize 65 exceptional authors and legal organizations for their reporting of complex legislative and litigation news, as well as their strategic insight and overall legal industry knowledge. The recipients were selected by the National Law Review’s editors from a pool of over 100,000 legal news and analysis articles. This is the first year the National Law Review formally recognized the unique talents of less than 1% of our contributors. The “Go-To Thought Leadership Awards” recognize 65 exceptional authors and legal organizations for their reporting of complex legislative and litigation news, as well as their strategic insight and overall industry knowledge. “Article of the Year” Award: “USCIS Outlines Protocols for New Employment Permanent Residence Interviews" by Kimberly A. Clarke & Nina Thekdi of Varnum LLP.